The Reality Distortion Field (RDF) is a topic that I found particularly intriguing in the late Steve Jobs’ biography. By creating his own reality, Jobs was able to encourage and motivate his employees to tackle tough situations by making the situations appear easier than they were. I was so fascinated by the book and the concept of RDF that I specifically asked my mentor to meet with me at a popular book store, so that we could unpack the concept of reality together. 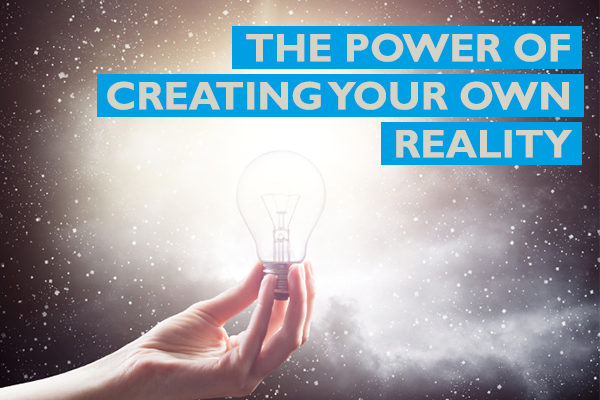 “Do you believe in the power of creating your own reality?” I probed my mentor. “All successful entrepreneurs that I’ve stumbled upon along my journey believe that they create their own reality,” he replied. “Do you just think about a new reality or is there some framework I could use?” I asked in anticipation. “In my experience there are six tools you can use to create your own reality” he responded. Everyone has a different experience of reality. Reality is 100% subjective. Successful entrepreneurs know this and accept it, and once they have accepted that they are the authors of their own reality, they begin to curate it. If your first response to challenges is to react by saying “It can’t be done!”, then this is your reality. It’s not real; it’s just real to you. There is, in fact, another reality where these same challenges can be overcome. In most instances where there is a dissonance between where you are and where you want to be, there are usually a handful of high-efficiency levers available to you that will help you create the most effect with the least effort. The trick is to identify these levers and choose the optimal one which will allow you to focus 20% of your effort to get a 100% result. For example, if you need to get a product to market, you can either spend time and effort building your own distribution channels or spend a fraction of the time designing a value proposition to partner with those in the market who already have existing distribution channels. Reality A is that it will take years to get your product to market. Reality B is it will take months. Both are real. It is better spending your time exploring the most efficient way to solve your problem versus the most traditional way, and you probably will end up solving it. Assumptions are a semi-informed historical view of reality – they are not the truth. Some entrepreneurs give assumptions the status of reality but successful entrepreneurs tend to rather reality test incumbent assumptions more regularly, because they realise the assumptions aren’t real, but are instead temporary and historical. Successful entrepreneurs have an authentic and inexhaustible ability to reframe situations. A disaster could be reframed with the question: “If this were a good thing, why would that be?” This question allows these entrepreneurs to capitalise (and take action) on all of the answers that ensue. By reframing an entire situation, entrepreneurs are given momentum and direction on what next steps to take. For example, if you lose your biggest account, this might be the turning point where you never allow any client to be more than 20% of your revenue. You then create this as policy and the result is a more rugged, shock-resistant business. By asking yourself how it could be a good thing, you also create an empowering policy and direction. Unsuccessful entrepreneurs who are faced with the same disaster would instead assume a reality that the situation is indeed a disaster. We’ve all done this. As entrepreneurs, we’ve all acted as if we are larger than we actually are, have more experience than we actually have, and portrayed that we are able to do more than we actually can. Great success stories are filled with these anecdotes, and it’s normal. Acting “as if” gives you an opportunity to live a different reality, even for a while, and create new opportunities and pathways. Spend more of your time and effort closing the gap between the veneer that you are projecting and your current reality. Unfortunately too many people spend that energy on projecting a bigger veneer than closing the gap. The energy required to keep up that veneer is exhausting and potentially fatal to the business. Just as you move from one reality to another, don’t make the mistake of thinking that reality B is indeed reality, just because you spent time and effort recreating it. It too is not real. If it does not work for you, you should begin your journey to reality C.
There is a level of freedom that comes from letting go of your attachment to reality, and it gives you the latitude to solve problems in a manner that cannot be attained when you are bound to a single reality. Develop the skill of dislocating yourself from your reality and reattaching again. It’s the most powerful skill you can develop as an entrepreneur.